Several days ago, a colleague pointed out to me a publication in the journal Arthritis Research & Therapy that came about largely through collaboration with scientists at ORGENTEC Diagnostika. Needless to say that this article was already familiar to me – already before its initial online publication in the summer of this year, I had read excerpts from it and extensively discussed the work and the results of this evaluation study with co-workers and clients. We were somewhat surprised, however, to find that the article Immediate Determination of ACPA and Rheumatoid Factor – a Novel Point of Care Test for Detection of Anti-MCV Antibodies and Rheumatoid Factor Using a Lateral-Flow Immunoassay would have such an impact that it became a “highly accessed” paper in the Arthritis Research & Therapy journal! So, what is the subject of this research article? – In brief: The article by Franziska Renger, Eugen Feist and the other scientists at the Charité Universitätsmedizin Berlin, as well as ORGENTEC co-workers Holger Bang and Gert Fredenhagen, describes the technical development of our rapid test, rheumachec, and presents the data from an evaluation study of this point of care test for RA diagnosis. I have summarized the results of this study for you in an ORGENTEC Research Update that you can download as a PDF document. I don’t think I need to say much about rheumatoid arthritis on this site. However, I will say a few words about the clinical diagnosis of rheumatoid arthritis, and about the importance of laboratory tests for diagnosing this debilitating autoimmune disease nowadays. Ambiguous symptoms – laboratory tests can help! The right laboratory tests are particularly helpful in RA diagnostics at this early stage of the disease and when clinical symptoms are ambiguous and unclear. These assays include the detection of rheumatoid factors, or: RF, and determination of anti-citrullinated protein antibodies, ACPA, with the corresponding ELISAs. The great significance that antibody serology has attained in the diagnosis of rheumatoid arthritis is also reflected in the 2010 ACR-EULAR Rheumatoid Arthritis Classification Criteria, the “new criteria for the RA classification”. These criteria, which were established by the American College of Rheumatology (ACR) in collaboration with the European League Against Rheumatism (EULAR) and which have replaced the “old” ACR classification criteria for RA from 1987, assign a new and significant role to the detection of autoantibodies – specifically the ACPA and rheumatoid factors – in the classification of RA. This rise in the importance of autoantibody detection will be increasingly reflected in RA diagnostics and in clinical practice, of this I am certain (more about the 2010 ACR-EULAR Rheumatoid Arthritis Classification Criteria can be found in our blog posts of 24/08/2010: New Criteria for the Classification of Rheumatoid Arthritis and 28/08/2010: The 2010 ACR-EULAR Rheumatoid Arthritis Classification Criteria in brief). It is here, in the area of early RA diagnosis, that our rheumachec rapid test comes into play. In order to facilitate the detection of ACPA in clinical practice, our scientists here at ORGENTEC Diagnostika have used mutated citrullinated vimentin (MCV) to develop a very effective rapid test for point of care testing (POCT) upon suspicion of rheumatoid arthritis. It is this test that is discussed in the article Immediate Determination of ACPA and Rheumatoid Factor … by Franziska Renger et al. 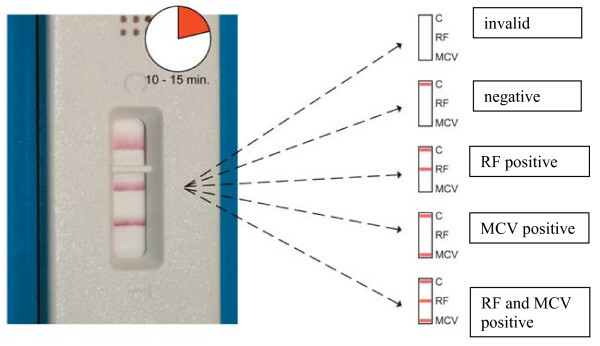 The rheumachec rapid test is a lateral-flow immunoassay that simultaneously detects autoantibodies against citrullinated vimentin (anti-citrullinated vimentin antibodies, anti-MCV) and rheumatoid factors in one test run. For the test, a drop of blood is placed on the test field of the test cassette, and the test is started by addition of an assay buffer. It usually takes a few minutes after the test is started that the first bands can be seen; the test result is ready after only 10 to 15 minutes. This figure is taken from the Research Article by Renger et al. : After 10 to 15 minutes the colour formation for all reactions is completed. The test device provides an integrated control system indication correct test performance or invalid test results. I have demonstrated the rheumachec POCT at various presentations with general physicians, rheumatologists, and orthopaedists. It really is very easy to carry out, and the results are easily and reliably read. The set-up and introduction for carrying out the rheumachec test are described in the original article by Franziska Renger, Holger Bang, Eugen Feist and co-workers; I will thus not describe the details here. Likewise the results of the comprehensive evaluation study, which can be found in the PDF of the Research Update, as mentioned before (link below). What really pleases us about the Research Article is the conclusion the authors draw from their results. This conclusion is a clear case for the use of the rheumachec rapid test as a screening tool when RA is suspected. The authors recommend that if a patient complains of ambiguous symptoms and there is reason to suspect rheumatoid arthritis, the rheumachec immunoassay should be carried out at this first consultation. If the test result is positive, the patient should be referred to a rheumatologist as quickly as possible (and, of course, immediately make an appointment!) so that the specialist can make a final diagnosis and promptly begin adequate treatment. Aletaha D, Neogi T, Silman AJ, Funovits J, Felson DT, Bingham CO 3rd, Birnbaum NS, Burmester GR, Bykerk VP, Cohen MD, Combe B, Costenbader KH, Dougados M, Emery P, Ferraccioli G, Hazes JM, Hobbs K, Huizinga TW, Kavanaugh A, Kay J, Kvien TK, Laing T, Mease P, Ménard HA, Moreland LW, Naden RL, Pincus T, Smolen JS, Stanislawska-Biernat E, Symmons D, Tak PP, Upchurch KS, Vencovsky J, Wolfe F, Hawker G. The 2010 ACR-EULAR classification criteria for rheumatoid arthritis. Arthritis Rheum 2010 Sep;69(9):1580-8. – free full text article! Renger F, Bang H, Feist E, Fredenhagen G, Natusch A, Backhaus M, Burmester GR, Egerer K. Immediate determination of ACPA and rheumatoid factor–a novel point of care test for detection of anti-MCV antibodies and rheumatoid factor using a lateral-flow immunoassay. Arthritis Res Ther. 2010;12(3):R120. – highly accessed! Free full text article! JS Smolen et al. EULAR recommendations for the management of rheumatoid arthritis with synthetic and biological disease-modifying antirheumatic drugs. Ann Rheum Dis 2010;69:964-975 – doi:10.1136/ard.2009.126532 – free full text article!